All those Ucom mobile subscribers, who plan to spend their summer in the most visited and coastal European countries, as well as Georgia, Egypt, Israel or Canada, are welcome to activate Ucom roaming service and enjoy special roaming rates for mobile internet, all incoming calls and calls to Armenia. 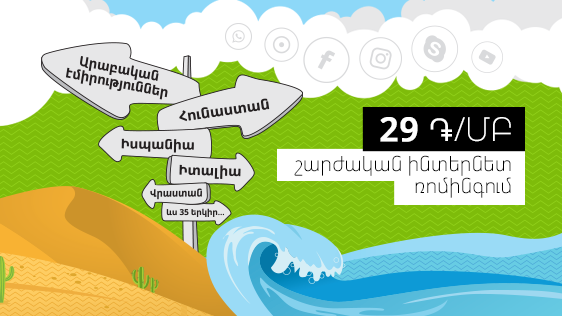 When travelling in 39 popular destinations the customers will pay 29 AMD per megabyte, 150 AMD for a minute of the incoming calls and calls to Armenia, while a minute of local and international calls, as well as a short message will cost 250 AMD. Moreover, the special rate of 29 AMD/MB will be applicable not only when roaming in the most popular countries, but in the United Arab Emirates as well. Here, by connecting to Etisalat network, the subscribers will benefit from the special rate of 400 AMD for incoming, local, international call, calls to Armenia and short messages. To benefit from this offer, customers just need to activate Ucom roaming service before departure by dialing *121# and switch to the relevant operator of destination country upon arrival. The complete list is available at the following link: https://www.ucom.am/roaming-summer-promo/en.